In Colorado, it’s easy to think that global warming (human caused or not) isn’t going to have much effect on your life. At worst, less snow in the mountains and maybe more water shortages (which are quite a big deal, but, hey, I just planted xeriscape landscaping and others could too.) Too bad it won’t be this easy. I just returned from the Eagle’s Nest Wilderness, where global warming is plain to see: bark beetle damage. Under normal circumstances the population of these little critters is limited by cold winters. For the last decade, they’ve been able to infest trees with impunity and the result is thousands of dead pine trees. The aspens, meanwhile, are happy. They’re less sensitive to the bark beetle’s burrowing and they are likely to make significant advancements once these dead trees fall or burn and make way. While lugging my backpack through the high country and among the spreading stands of aspens, I began to speculate what the forest would be like as a result. Aspens are beautiful. I’ve been told that they are the most photographed tree. Their white bark with strongly contrasting eye shaped markers where lower branches have fallen off as the straight trunked trees reach higher and higher are certainly stunning. Their golden, sometime fiery orange, fall color is legendary, as is the gentle quaking of their namesake leaves. Still, I will miss pine forest. It’s shadier, for one. The thicker branches make hiking in even loose forests a cooler experience in summer and a warmer one in winter where the wind is blocked even at ground level. The acidic needles of pines, firs, and spruces also changes the forest floor; limiting tall flowering plants and favoring a delicate mix of lovely flowers, like the fairy slipper orchid, who have adapted to the sour soil. The aspen understory was filled, first and foremost, by more aspen, which grow like grass in dense thickets, and where trees weren’t sprouting, tall sunflowers and cow parsnip enjoyed the only slightly filtered light. Beautiful, sure, but try camping in it. I saw a pair of pine squirrels vigorously fighting over territory and I imagined they’re not called pine squirrels by accident. They may not do well enough to be renamed aspen squirrels. I can only guess at the impact on other animals who depend on the eco-system that is so effected by the pines. Is this how the forest will look? 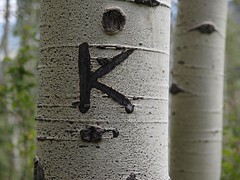 Saddest, and silliest, of all, though, was the realization that the pretty white bark of aspen trees, which native Americans learned you could rub the powder from to use as a natural sunblock, is a perfect canvas for graffiti. Marked once, a heart surrounding John + Mary will remain right where the lovers put it, long after their divorce is final. Their testament does not, as some imagine, grow higher with the tree or grow over (except, perhaps, in very, very mature trees). If even one in a thousand visitors to the aspen forest think this might be a good place to record their love for posterity, the whole forest will be tattooed in no time.